This is another one of my favorite photos from 2014 wedding season. This photo was so special to me, it ended up on the cover of my magazine. 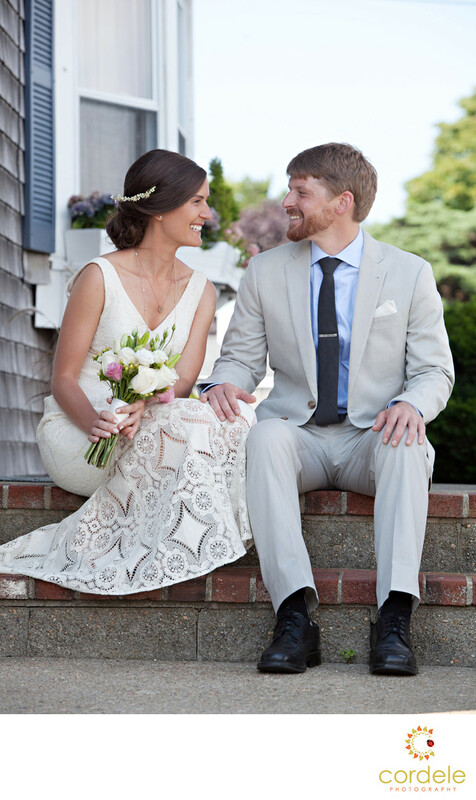 Aislinn and Derek got married at a private residence on the cape. The light was a little bit more harsh than I would have liked so we were looking for places with shade that made a good backdrop. The front steps seem to work well except it was a high traffic area. We kept having to stop and ask people to move out of the shot, or close the front door. I love the pattern on Aislinn's dress. It was a hand knitted dress and it was so simple and perfect for a beach side wedding. Derek's suit was simple as well and tied into the light pastel color template that the wedding had going.